Custom work can be a challenge but the results are gratifying. The secret power of f-wear pendants. A month or so ago I decided to act. I had had enough of the political shenanigans, civil unrest, and the mean spirited and vile actions from our nation’s supposed leaders. The events of Charlottesville were the final straw. I needed to do something. Something that would bring people together. Over the course of a few weeks in September, I started bouncing around the idea of doing some sort of fundraiser thing, supporting some sort of organization or other that is working to counteract Trump’s policies. I chatted with a few of my pottery colleagues, an artist and a pub owner. We thought we might be able to make 100 ceramic vessels, and maybe we could round up 30 or so artists to paint them and then maybe we could donate the money to the Berkshire Immigrant Center. So, we set off. Amrita skilled upside down drawing. 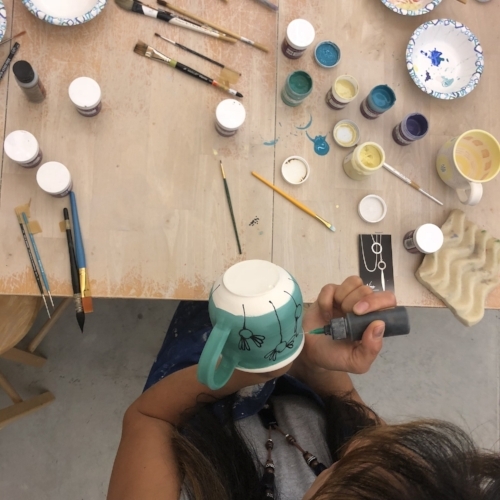 We wondered about whether we could really sell 100 mugs at $100 dollars, whether the artists we asked to participate would say yes, whether these artists would be able to apply their skills to a new medium, whether we could make it work. We gave it a shot. The response to our initiative has been overwhelmingly enthusiastic on all fronts. Currently, there are over 60 artists on the slate from Massachusetts, Vermont and New York with more asking to be involved. We’ve held vessel painting sessions that turned into a sort of art therapy. We’ve met so many new friends and have learned from each other. We’ve been inspired by the creativity, the generosity, the devotion and the spirit of those who have participated and supported our project. And already, we are chattering about something bigger and better for the future. Our final step is to host an event where those who have made their donation will come and take home one of the ‘vessels for change’. These vessels will speak of the hands of those who crafted them, of those who painted them, and of all of the people who supported this effort. They will, especially, embody hope for our immigrant community. Like people, the vessels are elegant, humorous, sophisticated, wonky, bold, subtle, tall, short, wide, thin, delicate, rough, and flawed. But, all will be loved. We will have raised more than $10,000 for the Berkshire Immigrant Center but we are also forging new bonds within our community. For both of these reasons, I am brimming with gratitude. If you have ever been to Hancock Shaker Village you'll know the sense of calm that permeates and the simple straight forward no-nonsense beauty that defines it. Its no wonder they called it the "City of Peace". This weekend I had the immense pleasure of spending 2 days in the historic round stone barn at the 20th Annual Hancock Shaker Village Country Fair. The barn was built built in 1826 to support their dairy industry, housing animals, and grain and facilitating the movement and storage of horse drawn carriages. The echoes of the past reverberated this weekend as the sheep and goats and donkeys that shared our market space provided background vocalizations. The Shakers were sellers too. Their crafts and herbs and industriousness were well known in the area. In true Shaker style, this weekend's market place featured many wonderful artisans and sellers. Two of my favorites were Frances Culley with her hand dipped beeswax candles from Root & Tuber Works and Annie Kennedy's School for Style vintage clothing and accessories. I also fell in love with taking photos of my work in this space. I think there might be a trip back there to stage a few more photos. And then there was the barn and the village and sun! Thanks for the fun - Hancock Shaker Village. Thanks for purchases and conversations - shoppers. Thanks for sharing this weekend with me - friends ! Last Thursday, a group of local potters got together at a neighborhood restaurant to host a last minute holiday sale. Our original idea for this event sprung from our desire to do something together. We’ve held this event only twice but it is already one of our favorites. We get so much pleasure from seeing our work gathered together in one place, oohing and ahhing over each others’ creations, helping each other set up our displays, operating our online payments systems, and sharing French fries. The relaxed atmosphere gives us more time to talk with those who attend and meet new friends. But we also feel good about being part of the local economy and the benefits that buying local brings to our region. A 2009 article in Time Magazine, explains: “…when you buy local more money stays in the community. The New Economics Foundation, an independent economic think tank based in London, compared what happens when people buy produce at a supermarket vs. a local farmer's market or community supported agriculture (CSA) program and found that twice the money stayed in the community when folks bought locally. Boyle also notes that “many local economies are languishing not because too little cash comes in, but as a result of what happens to that money. "Money is like blood. It needs to keep moving around to keep the economy going," he says, noting that when money is spent elsewhere—at big supermarkets and other services such as on-line retailers—"it flows out, like a wound." I like to think about the where the pottery money flows and how we make an impact on our local economy – we buy many of our supplies from Sheffield Pottery, a clay supply house in Sheffield, MA; we rent spaces on Spring St to showcase our wares; we teach classes; we attend classes; we pay for booths at farmer’s markets and craft shows; we hire electricians and carpenters to make improvements in our studios; we purchase greenery from florists to show off our pots. At events like this recent one, our customers buy our goods but also buy snacks and meals and drinks at Hops and Vines, who in turn pay their employees and purchase local grown food. All of these transactions help our local economy thrive. And in the spirit of the holiday season, we chose to make a contribution to a local non-profit. Last year we donated to the Berkshire Food Project. This year we are collectively making a $500 gift to Berkshire Immigrant Center, a percentage of our take at this sale. All of this is thanks to you! We recognize that our goods are more expensive than mass produced products you can find online on in big box stores but we like to think that the value is much greater – to the economic benefit to our community and to those who experience the pleasure of using a unique handmade object. If you missed this event and you are in the market for something let us know. Contact information for the participating artists is noted below. Thursday evening, I will be participating in one of my favorite 'sales' of the year. Its a time when many of the Williamstown/North Adams area potters and ceramic artists get together to breathe a collective sigh of relief that the hectic holiday shopping season is coming to a close, most of our packages have been mailed, and the kilns have been turned off. It is with much joy that I get to line up my pots with those of my friends in this biz and invite our community to come see what we've been up to for the past year. The artists in our group are diverse; from those that make functional work to those that concentrate on decorative or sculptural works. 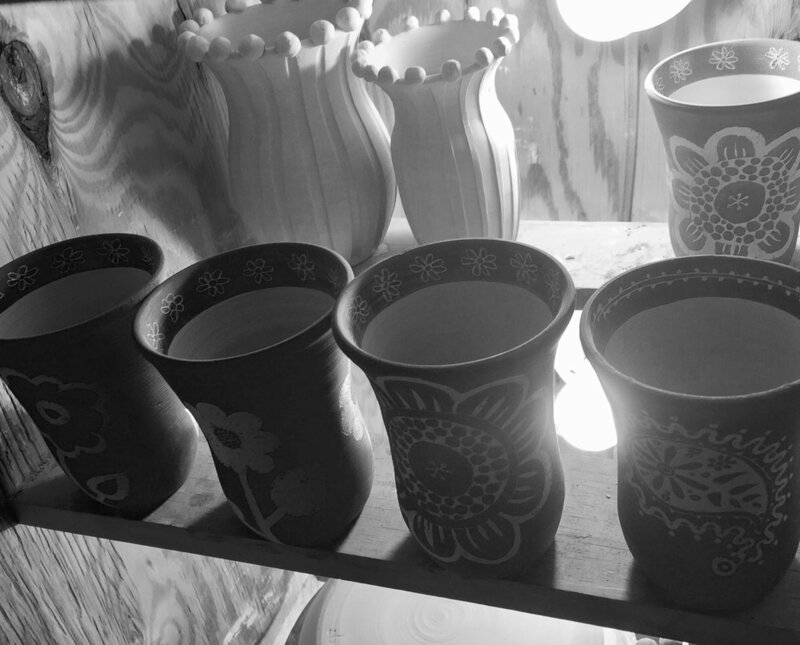 Collectively, our pieces are made of low fire earthenware, medium temperature stoneware, and high fire porcelain. We work in our own studios, or community studios or we share space. We use electric (oxidation) kilns and gas (reduction) firing. We mix up glazes and paint and etch and dip and pour to bring out a surface that sets off the form just so. What we have in common is our love of this magical, sometimes maddening material that we throw or sculpt or carve or stamp or roll into the forms that we hope are beautiful, useful, and thought-provoking. At times our pieces crack, or the glazes act in ways we weren't expecting, or some other disaster befalls our work. We learn, we adapt, and we start again. Our tradition of coming together like this is relatively new. This is only year 2. But we have already grown from 7 makers last year to 9 this year. We are all so excited to get together to talk about our work with each other and with you. We are immeasurably grateful to our local community that supports our work through their purchases and interest, for the shops and galleries that carry our work, for holiday market and craft fair organizers the provide us venues, for event managers or restaurants that highlight our pots in their spaces or host events such as this, for our 'online' community that reaches out to us from afar, for our family and friends that cheer us on, and for our each other for feedback, advice, laughter, commiseration, and cheer. If it weren't for all of you, there wouldn't be all of us. In the spirit of 'giving back' some of the proceeds of our sales will be headed to local non-profits - Berkshire Immigration Center, Planned Parenthood and the Oak Hill Children's Center in Pownal, Vt. I hope you can stop by, we’ll be at Hops and Vines, Water St. Williamstown, 4-8pm, December 15. New pots in the works. They'll be at Hops and Vines on Thursday. Randonée skiing can teach you a lot about life.